Description: Pink. The text: XV OLYMPIA HELSINKI 1952. Date: 3 VIII 1952. Section: E 51. II. lk. [II class]. Rivi [row] 10 Paikka [seat] 6. Picture: equestrian showjumping. 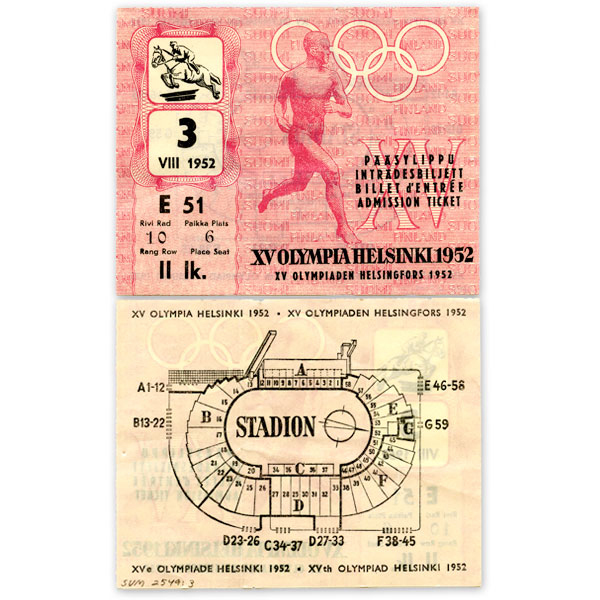 Other information: Ticket for the Olympic showjumping competition in the Olympic Stadium on 3 August 1952. The individual competition was won by France’s Pierre Jonquères d’Oriola with his horse Ali Baba, the team competition by Great Britain.